How do you manage PKU? Since all foods with protein contain phenylalanine (PHE), a person with PKU must restrict the amount and types of food containing protein. For this reason, PKU is managed with a low-PHE diet consisting of foods low in protein and a PHE-free metabolic formula. The main sources of foods with protein allowed in the low-PHE diet are fruits and vegetab les, and a limited amount of cereals and grains. In addition to foods, individuals with PKU must drink a special PKU metabolic formula to supply the body with the necessary protein requirements the body needs for growth and maintenance, without the addition of the offending amino acid, PHE. There is also a wide range of commercially available low protein food products available for today’s PKU population. Click to View Nutricia’s Full Range of PKU products. Nutrition management of PKU includes frequent monitoring of blood PHE levels and regular clinic visits. Blood PHE levels can be measured either at the clinic or hospital, or collected at home and mailed to the clinic for analysis. Managed blood PHE levels in persons with PKU are between 120-360 umol/L (2-6 mg/dL)1 . 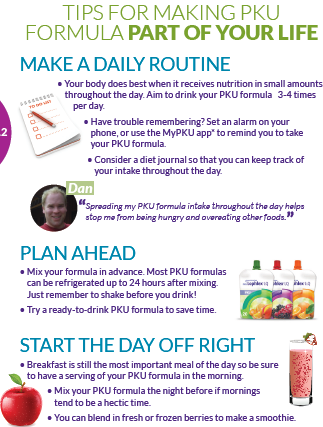 All patients with PKU, who are not started on diet immediately, will begin to build-up PHE in the blood and brain. In an infant with classic PKU, poorly controlled PHE levels will result in irreversible brain damage. Therefore, it is essential that each infant who is diagnosed with PKU be started on a low-PHE diet to lower and maintain PHE levels within an appropriate range as soon after birth as possible. If a child or adult previously diagnosed with PKU, and on diet, decides to discontinue the diet, he or she will begin to build up PHE in the blood, which may increase PHE levels in the brain. Over time, toxic levels of PHE in the brain can result in a change in their brain executive functions. Executive function involves thinking skills, memory, and concentration, all of which can decline with high PHE levels. Also, an adult might feel shaky and clumsy. If an adult is exposed to high brain PHE levels for a long enough time, IQ losses may occur. 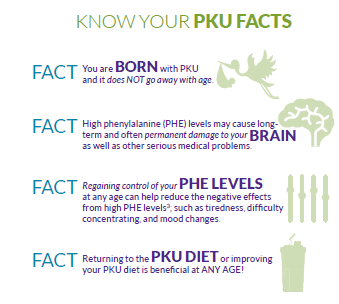 For these reasons, it is important that persons with PKU stay on the low-PHE diet for life1,2. 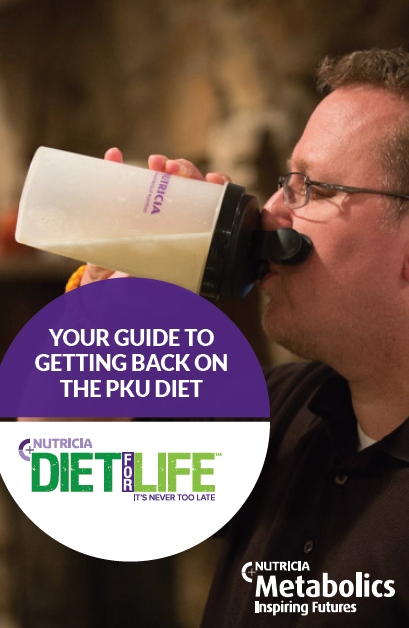 To learn more about the PKU diet or for assistance returning to the PKU diet plan email DietforLife@nutricia.com or call 800-605-0410. 1.. Singh RH, Rohr F, Frazier D, et al. Recommendations for the nutrition management of phenylalanine hydroxylase deficiency. 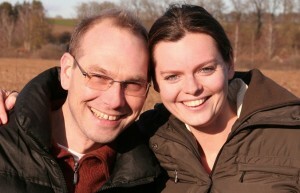 Genet Med. 2014;16(2):121-31. Nutricia is a registered trademark of N.V. Nutricia. Copyright 2015 Nutricia North America, Ic. All Rights Reserved.